Find an oasis of stylish comfort at Sheraton Hotel & Towers Ikeja. The hotel is in the heart of the industrial Ikeja area and within the reach of major tourist attractions. It’s also easily accessible from Murtala Muhammed International Airport. Sheraton Hotel‘s 332 newly refurbished guest rooms create a relaxing haven.It also has a new business centre with a full range of amenities for you to enjoy. Located on Mobolaji Bank Anthony Way in Ikeja, Sheraton Hotel is within a close proximity to government establishments and offices including Lagos State Secretariat as well as the Governors Office. 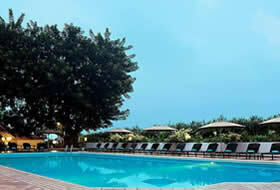 Guests can enjoy a warm day lounging by the outdoor pool or exploring the surrounding area of this Lagos hotel. As evening falls, find comfort in the inviting atmosphere of their four fine restaurants. Explore your creativity with their well trained and friendly staff helping you with everything from audiovisual support to special menus. Connect over cocktails or a variety of Indian delicacies, Chinese dishes or international fare. From the live entertainment at the Lobby Lounge and Pool Terrace to the festive atmosphere of The Club, every evening will bring excitement. Sheraton Lagos has 264 elegantly furnished and air conditioned classic rooms, ideal for business and leisure travellers. Each room is equipped with the signature Sheraton Sweet Sleeper Bed for ultimate comfort after a long day. WIFI access, a working desk and phone services ensure the business person is kept well connected throughout their stay with us. Other features for your complete comfort and relaxation include television, iron and ironing board, mini bar, hair dryer, in-room safe, maid service, 24hr in-room dinning, coffee and tea makers. These 61 rooms located on the Club Floors of the hotel offer an array of privileges guaranteed to make you belong in the Sheraton Lagos Hotel. Upon arrival. you will be guided to check in on the Club Floor, enjoy complimentary breakfast in the private lounge and did we mention valet service too? Whilst your room is prepared for your evening relaxation through our turn down service, relax and enjoy afternoon tea in the Executive Lounge. This lounge offers access to high speed internet, television and all day snacks. Experience one of the four different suite categories, all located on the top floor of the Sheraton Lagos Hotel. Enjoy the VIP privileges of staying on the Club Floor and the genuine friendly service we have to offer. The hotel suites feature spacious, well decorated room with separate sitting and dining areas for your convenience. This room category is equipped with en-suite conveniences, comfortable bed, internet access, television with satellite TV channels. 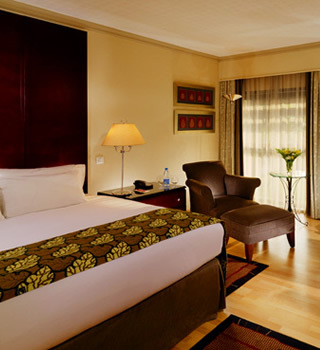 Sheraton Suites include Business Suite, Junior Suite, Diplomatic Suite and Presidential Suite. P.O. Box 21189 Airport Road, Ikeja, Lagos. Proceed southwest through the local airport to the roundabout. Turn right towards Maryland and continue approximately 3 kilometers along Mobolaji Bank Anthony Way.